Mt. 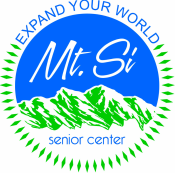 Si Senior Center is available for your birthday party, baby shower, retirement celebration, memorial service, graduation celebration, or any celebration you may be planning. Options include a large dining room that seats 100 with optional access to an licensed commercial kitchen and coffee service. If you need a smaller space, consider our multi-purpose room for your event. For more information or to reserve space at the center for your next event, please call Demelza Riley at 425-888-3434.